I admit this looks chic but I have no idea how you’d get the laces–two pairs, no less!–to do this and still have room for your feet. Which is the point. Of shoes. I don’t think of myself as being directly influenced by the style blogs I read–I’d never, say, see a particular dress or a bag on a blog and think “I have to buy that!” (also I really can’t buy that by thrifting…). 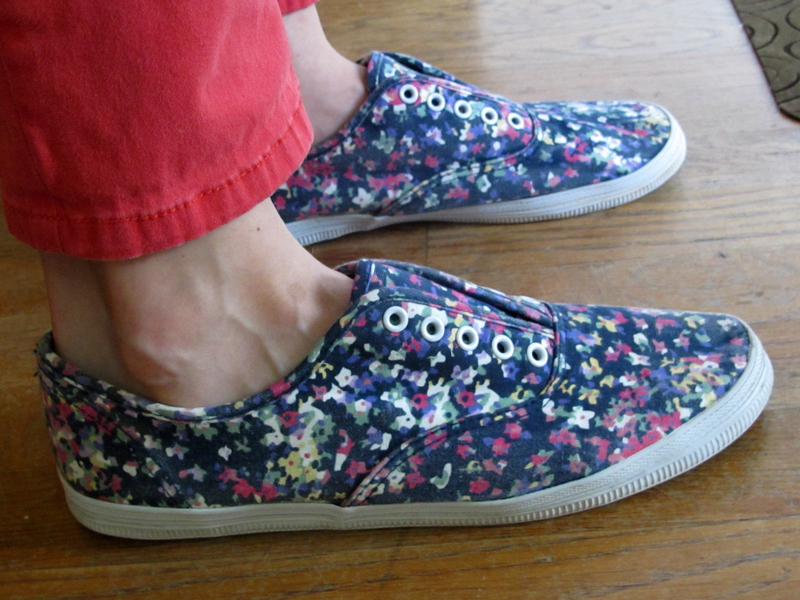 But when I thought to myself, “Low-rise floral sneaks with no laces? Cool!” I realized that my asthetic is definitely shaped by the images I’m drawn to online. In that sense blogs are also responsible for one of my favorite silhouettes–slim-ish pants with a boxy/loose top–as well as my cautious flirtation with neutrals. Seeing people over and over again pull off a certain look is a powerful suggestion to your subconscious–which I guess is how fashion marketing works, or how fashion in general works. 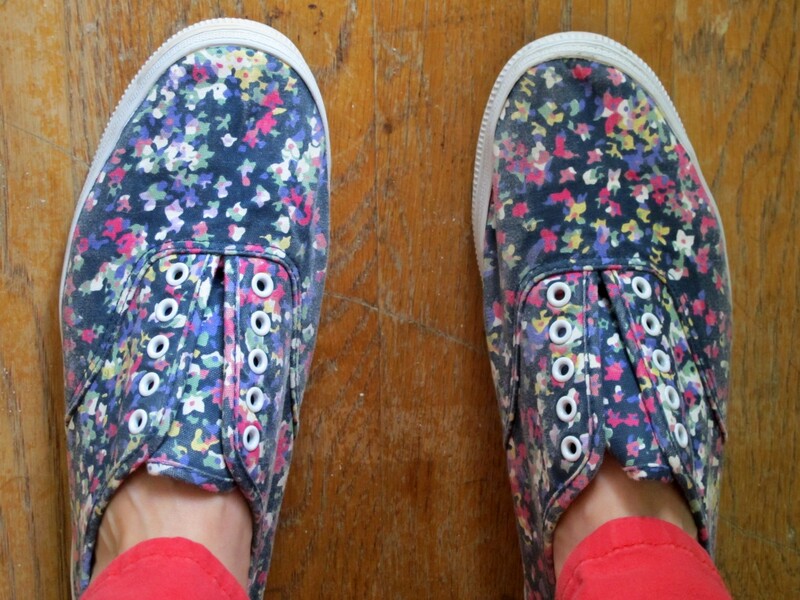 What do you think of the floral sneaks–yay or nay? Laces or no? Socks or naked feet? And how does what you see online (or in print) influence what you wear in real life? **Mom-core: a particularly mom-ish manifestation of normcore. ← Thriftshop Chic on Instagram! 1. 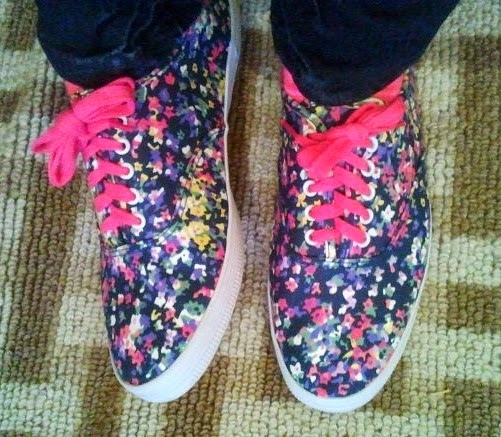 I like the floral sneaks on you but I don’t think I could ever pull them off. 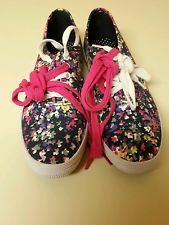 Also, even though you thought it looked mom-core to have the fuschia laces in, I think it would be cool if you wore something that looked like that (mom-ish) as part of your style as a young, hot, hip woman. But I’m into that. I love it when a look almost looks like a costume but you wear it anyway, e.g. a nautical/sailor/yacht look or hippie look. Another one of my favorite things is wearing two things that I’m not sure go together. 2. I was wondering why you took the laces out! It’s ok but I think it’d be SO cool if you could figure out how to do the two-different-colored-laces thing. 4. Pretty much the only thing (person) that influences what I wear in real life is me (and this blog ;) ). 1. I think you totally COULD pull them off! Do you mean you’re just not into the floral motif? Beacuse you basically wore your Chucks in this way the other day (with slim jeans, no visible socks) and it was super cute. I’m with you on the costume-esque look. I definitely have the sailor element happening in my wardrobe…and once I dressed in so many bright and tropical colors with fish earrings because I wanted to feel like I was going on a cruise. It worked! 2. Tell me more–one color lace in each shoe? Both together? 3. I can’t stand no socks with leather shoes–too much sweat and grime!–but canvas sneakers seem to cut down on that considerably. Thanks for classing me in with the cool kids! 4. So I’m going to push back on number 4–obviously YOU make the call on what you like and want to wear, and it shows in your great personal style! But everyone’s ideas of what to make their own come from somewhere–even what a store has in stock influences what we’re drawn to. And if someone wears current styles, something about how the fashion industry is putting things together speaks to them (I’m thinking the infamous Devil Wears Prada cerulean sweater scene) because they’re not making all their clothes or buying exclusively vintage or only thrifted pieces from 1990. Think about a piece of clothing you LOVE and what first drew you to it–a color that seemed fresh, a silhouette you’d admired on someone else (or in an ad or in a store or on tv/online), a detail (like an exposed zipper) that felt current…why did you choose that over something else you could have bought? This is a really interesting topic so come back at me with whatever you think! 1. 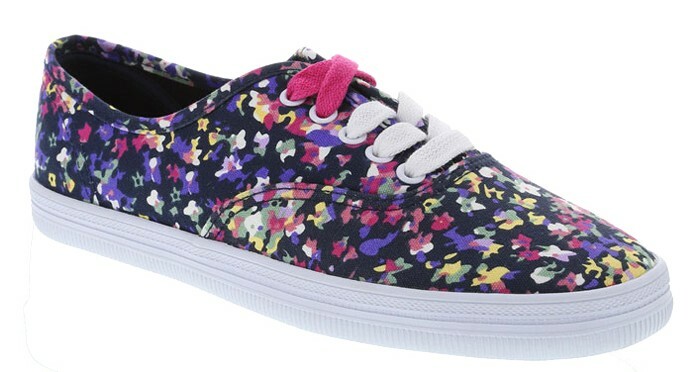 I don’t think the floral motif would look good/cool on me in any way. 2. I think one color lace in each shoe would be cool but both together would be the coolest! 3. Yeah, no socks with leather shoes can get gross unless that’s the way the shoes were intended to be worn (I have a pair of leather boots that are like this). Fortunately, that doesn’t seem to be a problem with canvas sneakers. 4. Obviously, I’m just going to push right back. To be clear, I said I’m “pretty much” the only one that influences my style which doesn’t mean I’m NEVER influenced by outside actors. It just means that’s not usually how I choose what I want to wear/buy which I think may be the case for a significant group of people. Of course, I’m probably constantly being influenced subliminally by evil marketing devils at every given moment but I’m talking about what I’m actually aware of. I wouldn’t necessarily describe anything I wear as “current” other than that I may have recently purchased it. In fact, the greatest way current styles influence me is that I tend to look for and wear things that are the opposite of that style. The LAST thing I want is to look like every other woman walking down the street. Also, a lot of trends don’t look good on me which isn’t surprising given very few things that become trendy in America are conceived with a woman-sized Black woman in mind. An example of this is the high-lo trend (which may be over now). I could never find any high-lo dresses that looked good on me and then I found one where the lower part of the dress is asymmetrical and that’s the only one that worked. I bought and still love it and should probably wear it more. Also, I don’t really care about trends at all. I read an article like 6 months ago (?) that said leggings are over and I thought, “Who cares?” I LOVE leggings and I will continue to wear them every chance I get. This is apparently what everyone else thought too because I still see leggings in stores, on Project Runway and in advertisements in my inbox. So if anything, I (and many others) am the one influencing fashion. ;) Regarding a piece that I love, I’m thinking of the shirt I almost gave away to Goodwill but kept because I was able to make it work with another piece in my closet. I was drawn to it because I like it. I don’t recall ever seeing anyone else in something similar. This shirt is approximately 12 years old now, if not older, and I STILL love it and think it can hold its own against the dress I bought last week. Lastly, there is an aspect of my shape that is disproportionate to the rest of my body so I know what silhouettes work for me and those are the ones I tend to stick with. This doesn’t prevent me from trying on different silhouettes but those silhouettes usually don’t work out. “Which is the point. Of shoes.” Have you *seen* the high heels that people gush over? Makers of those “shoes” need this message. Please tell them to stop it. Definitely no laces and naked feets – for looks. But how do you keep them on your feet and also not sweat and get blisters? These little slippy sock things: Google “footies” and try a sheer pair. They REALLY help me feel not nasty in my sockless dress shoes. If you get a color close to your skin tone or to the color of your shoes, they also blend in pretty well (in case they don’t perfectly align with the cut of your shoe and a little bit peeks out).